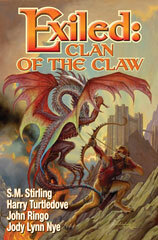 Amazon.com lists an August publication date (but publisher Baen Books says June) for "Exiled: Clan of the Claw, Book One", a book containing three connected novellas by Harry Turtledove, John Ringo & Jody Lynn Nye, and S. M. Stirling. ... the Mrem Clan of the Claw and its sister warbands ... face the Lishkash, masters of a cold-blooded empire of slave armies and magic. Amazon says the book is edited by Bill Fawcett. Update: Read Fred's review. Fawcett has been promoting his felinoid Mrem warriors versus reptilian villains for over twenty years. In 1989-1990, Fawcett packaged four "Guardians of the Three" fantasy paperbacks for Bantam Spectra (V. 1, "Lord of Cragsclaw", by Bill Fawcett & Neil Randall; V. 2, "Keeper of the City", by Peter Morwood & Diane Duane; V. 3, "Wizard of Tizare", by Matthew J. Costello; and V. 4, "Defenders of Ar", by Jack Lovejoy), about the catlike warrior Mrem fighting the evil "liskash" lizard villains. Ten years later, in 1999, Fawcett packaged three "Shattered Light" paperback novels (1, 2, 3) for Pocket Books (by Richard A. Knaak, Chelsea Quinn Yarbro, and William R. Forstchen & Jaki Demarest), with no connection to the "Guardians of the Three" novels but also featuring catlike mrem (not capitalized this time) warriors fighting lizardlike "Lizcanth" evil wizards. Now Fawcett has apparently advanced to hardcover status and prestigious s-f authors. It will be interesting to see how this iteration of the Mrem-vs.-Lishkash anthropomorphs turns out. Now, make me a story with mammals as the villains!